Claire Martin is the essence of a Queen Bee: after falling in love with the community-oriented society of honeybees, she left her high-powered career in the NYC publishing world to manage hives upstate. Within a few short years, Claire grew her colony of a business from one hive to over 300. Next came a line of raw, unprocessed foods, and finally, a truly special, nuanced honey-infused whiskey made predominantly from NY State rye, all under the umbrella of Catskill Provisions. Claire is an inspiration to all of us working hard to create a greener, sustainable, and more delicious place to live! 5 years ago I started this company with one varietal of our honey. First to be jarred was our late Summer, wildflower raw honey…complex, delicious, amber color. today we have 22 SKUs plus our NY Honey Whiskey! It’s been pretty amazing as growth brings lots of lessons with it…we’re still very much about creating sustainable, small batch local products. I started with 2 hives, grew up to 70+ then I needed help and I needed it now! I reached out to two beekeepers that I know well and trust to join forces with me. We now are efficient and always keeping to the local, sustainable model I started out with. 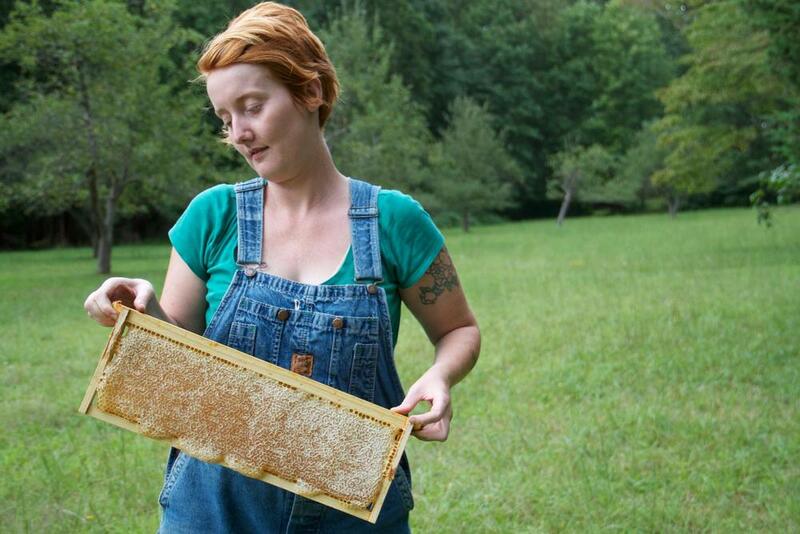 Autumn Schoen is a new beekeeper from the Philadelphia area. Autumn works with young children both professionally, and as mother of two and a half year old Catherine, so she is no stranger to navigating the often sticky relationship between kids and bees. But this past April, she and Catherine took their mother-daughter relationship with bees to the next level, hiving their first colony together with their friends at Brooklyn Grange; not too many mothers can say they are teaching their kids the art of beekeeping, especially at such a young age! Autumn, along with her devilishly handsome husband John, are looking to establish a gentleman's farm in Maine with the hope of having five hives on their blueberry barrens. In celebration of Mother's Day, we've asked Autumn what it is that drew her to beekeeping, and why she felt compelled to share that passion with her daughter. I took a one day class led by a master beekeeper. It was a wonderful start to this adventure, but mostly it has been trial by sting. Crown Heights’ Butter & Scotch is, according to owners Allison Kave and Keavy Blueher, “the bar & bakery of your dreams. The women behind the unusual combination-business specialize in creative riffs on classic American desserts and craft cocktails. Brownies and boulevardiers, anyone? Allison and Keavy also happen to be the proud recipients of the Voters Choice Award at the inaugural Queen Bee Cocktail Classic in 2014! Their entry, “The Honeychile Rider,” featured Tuthilltown Spirits’ Half Moon Orchard Gin, made just north of here in the Hudson Valley, as well as Mike’s Hot Honey (you can read our interview with Mike here! ), combining these local ingredients with tropical passionfruit, and Bitterman’s Tiki Bitters, for a flirty, spicy cocktail that stole attendees’ hearts and palates. Butter and Scotch know their way around honey both in the kitchen and behind the bar. Today, on the Bee-Log, they join us, alongside Beverage Director Jen Marshall, to share the Butter & Scotch story with us! Michael Kurtz, of the eponymous “Mike’s Hot Honey,” has been making this chili pepper-infused goodness since 2011. Born in Brooklyn, NY, the super versatile condiment gained popularity by being drizzled on some of the borough’s best pizza pies, but as fans know, this stuff is delicious on practically anything: in marinades and on roasted or BBQ’d meats, to fruits, cheese, salads, and even ice cream! The Honey Week crew can confirm: it’s especially tasty in cocktails, too. How did you get interested in honey and why did you decide to make it hot? Oddly enough, pizza was my bridge into the world of honey. I've always loved making, eating and talking pizza. I lived in Brazil as a college student. I was on a camping trip with some friends and we hiked into a small valley town where we visited a tiny pizzeria. The pizzeria had jars of honey with whole chile peppers sitting in them for drizzling on top of the pies. I love spicy foods and pizza and I really liked the flavor of the chilies and honey on the pizza. When I returned to the States about a year later, I began experimenting with different infusion techniques and different chile peppers and varietals of honey until I settled on the recipe that I still use today. In college, I had early prototype bottles of my infused honey in my cupboard; I called it Mike's Hot Honey from day one. Mostly, I just made it for my own personal use and sometimes I'd make larger batches for friends and family. In 2010, my pizza obsession led me to Paulie Gee's where I became a pizza apprentice. I eventually started working there making pizzas, and one day, I brought in a bottle of my hot honey for Paulie to try. He liked it and asked if I could make enough for the pizzeria to use on top of their pies. I started making it in small batches for the restaurant and people would come up to me while I was making pizzas asking if I would sell them to-go containers of the honey. Eventually, so many people were asking me for to-go containers that I decided to take the plunge and bring Mike's Hot Honey to market. After graduating from the School of Visual Arts I worked as a freelance designer and illustrator in New York City, eventually traveling to Shanghai and Italy to design for the giftware market. In 2000, I was unexpectedly introduced to beekeeping by a neighbor and became smitten after tasting fresh honey from the hive still warm from the bees’ bodies. The more that I learned about honey the more that I felt it should be regarded as a noble food and given the same respect as wine or olive oil. Eventually, I ditched my day job to become a full-time beekeeper and never turned back. Red Bee Honey is what happens when a hobby turns into a passion.